Republican Senator Susan Collins on Sunday said she received numerous promises before she was able to cast her vote in favor of the Senate’s tax bill. WASHINGTON — Republican Sen. Susan Collins on Sunday said she received numerous commitments from Republican leadership before she was able to cast her vote in favor of the Senate’s sweeping overhaul of the tax code this week. "I got a commitment that we're going to pass two bills, including the Alexander-Murray bill, and one that I've authored that will help offset the individual mandate repeal by lowering premiums," she said on Sunday's "Meet The Press," referring to bipartisan compromises negotiated this fall aimed at stabilizing the health insurance markets and lowering insurance costs. "I also got an ironclad commitment that we're not going to see cuts in the Medicaid/Medicare program as a result of this bill," she added. In the very early hours of Saturday morning, the Senate passed their version of the Republican tax plan, which would greatly reduce the corporate tax rate, offer some cuts for individuals, and remove some popular deductions. The tax plan is controversial, and narrowly passed by a vote of 51 to 49, with only one Republican – Sen. Bob Corker, R-Tenn., voting against it. But Collins said Sunday she was assured of the final Senate bill's value. "I believe that the amendments that I added on medical expense deductions, on property tax deductions, on helping retirement security for public employees improved the bill," she said. 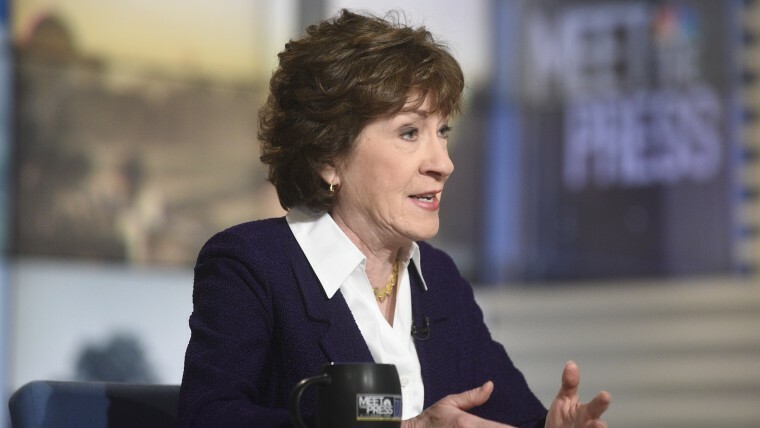 Collins also maintained that she believes the legislation would not result in an increase of the deficit, because economists she’s talked to claim the bill would result in a higher than expected level of economic growth. Those assertions run contrary to estimates from both the Tax Foundation and the Joint Committee on Taxation, which use dynamic scoring to predict the bill could cost an estimated $516 billion and $1 trillion, respectively. The Senate's bill still has to be reconciled with the version that passed in the House before a final version can make it to President Donald Trump's desk to sign.